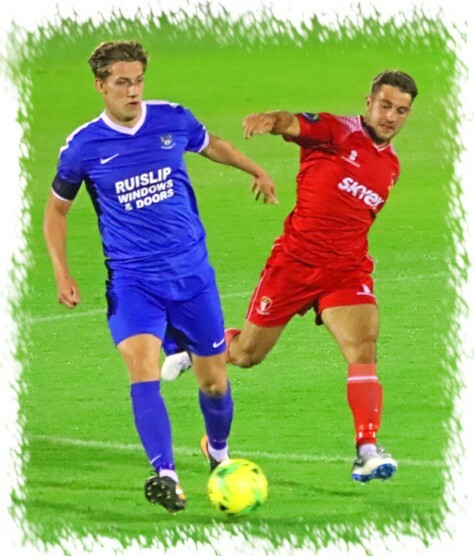 Hayes & Yeading bounced back to scoring form on Tuesday evening at the SKYex by hitting Northwood for six although the game was very even until the 52nd minute dismissal of Woods defender Sam Tring for a second caution when he brought down Lee Barney. Manager Paul Hughes made three changes to his previous starting line-up with Ola Olajubu coming into the midfield in place of injured skipper Scott Donnelly while Hassan Jalloh and Duncan Culley came in for Josh Chamberlain and Lewis Toomey respectively who both moved to the bench. On a chilly September evening, the game took a while to get moving with very little in the way of openings being created in the opening 25 minutes. In that time a chance apiece hit the notebook without really looking like breaking the deadlock with Woods Chris Gosling see a 20 yard effort held comfortably by Jack Smith and at the other end shortly after, Scott Bridges intercepted a poor clearance and crossed deep to the arriving Toby Little, his volleyed effort going across goal but wide of the far post. The first real save of the evening came on 29 minutes as the visitors played the ball upfield to Cameron Ferguson, he turned past his marker and hit a low drive from the edge of the box that Smith did well to push wide. Within a minute United themselves went close as Smith’s punted clearance was brought down expertly by Duncan Culley who then exchanged passes with Bridges before hitting a shot from an angle that went just the wrong side of the upright. 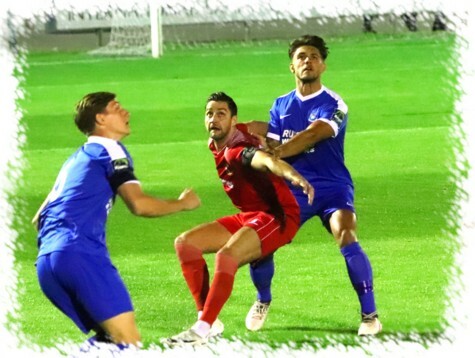 The deadlock was finally broken in the 38th minute, Lee Barney chased the ball to the bye-line and held off a challenge before playing it to Hassan Jalloh, his low cross to the near post being turned past his own ‘keeper by Woods skipper Carl Pearce with Culley putting the defender under pressure. One further chance came for United as the half closed out, Culley collected on the left side and played the ball infield to Little whose neat back-heel sent Jalloh into the box but his drive was too high to trouble Luke Sheldrick in the Woods goal. The visitors started the second half well and really should have levelled four minutes in when United were asleep at the back and a quick corner routine between Ferguson and former United man Kier Dickson saw the ball played into the centre towards an unmarked Hakim Nyariki at the near post, he totally missed the ball as did everybody else in the six yard box and it sailed away beyond the far post for a goal-kick. Three minutes later a pivotal moment came in the game when Woods Sam Tring brought down Barney in full flow and referee Tom Ellsmore duly dispensed a second caution which led to dismissal and the visitors were down to 10 men, something United were to really take advantage of. Just before the hour mark United struck for a second time. Bridges and Culley worked a neat exchange just outside the area, the latter finding Barney on the right side of the box and he in turn fired low across to Jalloh at the far post and he slotted home from close range. Two became four in less than 10 minutes as Culley broke his duck for the season before nailing another minutes later. On 63 minutes Ola Olajubu won possession and fed the ball forwards to Jalloh who took a touch before sending Culley through on goal with a perfect throughball, the United striker advancing before sliding the ball past Sheldrick. 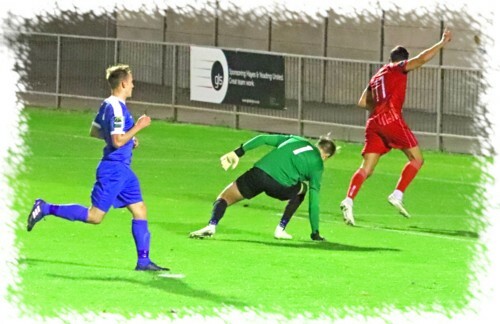 Two minutes later Culley had another, rising highest in the box to place a neat header from a Bridges free-kick beyond the reach of Sheldrick. United continued to push for more, Sheldrick got down quickly to hold a Barney effort after United’s top scorer had instantly “killed” a forwards pass before making room to shoot and then just seconds later a partial clearance by Chris Gosling dropped nicely to Ed Asafu-Adjaye, the defenders 25 yard drive smacking into the side netting with Sheldrick looking beaten had it been on target. The 81st minute brought about one of the craziest own goal’s seen for some time. Culley headed the ball down to substitute Lewis Toomey on the right side, his speculative centre was intercepted by the outstretched boot of defender Ben Andreos, the ball going past his own ‘keeper before striking the crossbar and going up in the air and dropping back into play and spinning back into the Woods net as Sheldrick stood perplexed. Sheldrick was twice in action soon after, firstly pushing wide a Bridges drive after he was set up by Jalloh and then Bridges himself laid the ball off neatly to Toomey who saw his shot held by the Woods stopper. Sheldrick was powerless to deny United a sixth a minute from time as Josh Chamberlain won the ball on the left and fed it to Jalloh who quickly returned the ball to Chamberlain in the area and he smashed it past Sheldrick. The combination of Bridges and Jalloh almost made it seven in stoppage time but Jalloh’s low shot was held by Sheldrick as referee Ellsmore brought proceedings to a close with United moving up to fourth in the early season table.